Here's an example of what I mean - the before photos are in the top row; the afters in the bottom. It's a little hard to see. I'm not a great photographer. 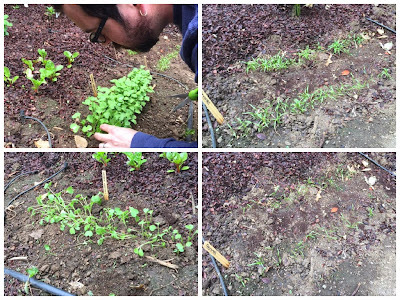 Will, thinning the radishes (left). I thinned the fennel (right). Will in the garden, thinning our beets. ready to be thinned...they're a little too little. And lest you think that those thinned out bits go to waste...they're totally edible, and totally delicious! We're going to have a radish, fennel and beet sprout (aka "microgreens" - they're not technically sprouts) salad with dinner tonight.